When I was in grade school, I liked every subject I studied. I think it was because they were the basics, and as such, were introductory. Like I said previously, I love learning, and in grade school everything was new. But even back then, I could tell what subjects I preferred. Once I got to middle school, and especially high school, those preferences became much more pronounced and developed into my favorites. By far, my most favorite subject was math. It just made sense to me. The beauty of math is that the more you learned, the more it lead to new ideas and the next level. If I forgot a particular idea, all I needed to do was go back to the last step, then build upon it to get to the next step. That’s what was so beautiful about math – everything builds upon the more basic concepts. This love of math grew with each subsequent level. From the basics of addition, subtraction, to algebra, to geometry, to calculus, to Boolean algebra, to analytical geometry, to statistics, and on and on. Guess what was my favorite type of question on a math test. Most people think I’m crazy when I tell them this, but it is a word problem. My love of mathematics, I believe, is what underpins the rest of my favorite subjects. Physics is awesome because, to me at least, it takes my most favorite subject, math, and applies it to the real world. From classical Newtonian mechanics, to quantum mechanics, to heat transfer – just like math, the next concept builds upon the last, all the way back to the basics. Sure, you had to learn some basic concepts first, but once you had those down, it was all a logical progression from there. What physics showed me was that, no matter how confusing the world around me, it could always be reduced to an equation, or a series of equations. And equations can be solved. That was very comforting to me in my adolescence. Another subject that takes math and applies it to the real world. Similar to physics, you had to understand the basics before you could advance. Chemistry, in my humble opinion at least, has more basics to learn than physics. Nonetheless, each new concept in chemistry builds upon the last. And what is the most beautiful concept and structure in chemistry? 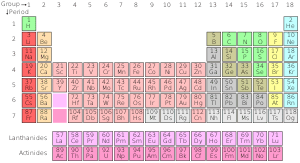 The Periodic Table of The Elements. How awesome it is that the basic elements of matter can be sorted into a logical, structured table like that! What does this say about me? Well, besides that I’m quite the oddball, that is. What it tells me is that I have an analytic brain, that logic factors heavily into my thinking, and that I’m not a typical person. But then, I’ve said as much before in previous posts anyway. How about you? What were your favorite subjects in school? Were you a math and science admirer (read: geek) like me?